The car was making a hiss noise when put into high gear at high RPMs so I decided to take it to the dealership in Boise, probably be the only Subaru dealership until Sioux Falls. We arrived right at 7 when they opened. Fortunately, the dealership could not find anything seriously wrong with the car, so we took off. 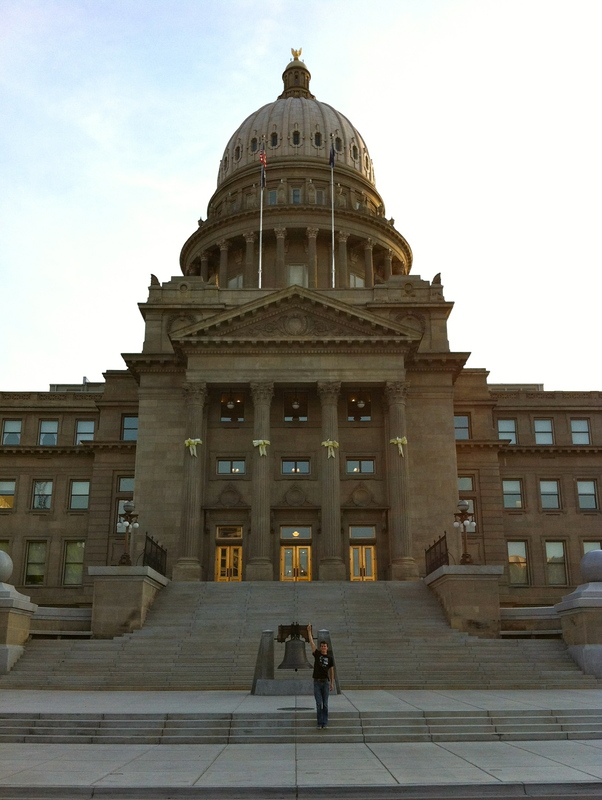 The first stop of the day was the Idaho State Capitol building in downtown Boise. It was a beautiful building with lots of marble and Corinthian columns, the way any state capitol building should look like. Unfortunately, the legislature was not in session, so the building was essentially a giant marble ghost town. There was no security at all (a first for a state capitol) and so we walked right into the governor’s office and sat in his desk- both the real one and the ceremonial desk with nobody to tell us otherwise. Pretty cool! From Boise we drove east towards Wyoming. Just past Mountain View, Mike passed two semis and what he thought was a guide car on a sharp curve at 30 miles per hour above the posted speed limit. Turns out the guide-car was actually the county sheriff. By the time they caught up with us about 7 miles later, a small squadron of cars was flashing their lights. The officers thought that we were smuggling drugs because we were speeding off the interstate with lots of stuff in our car. After talking to them, they let us go (amazingly) because we were so cooperative. It certainly pays to be upfront and courteous. 3 hours after leaving Boise, we reached our next destination, Craters of the Moon National Monument, which was described by President Calvin Coolidge as “weird”. 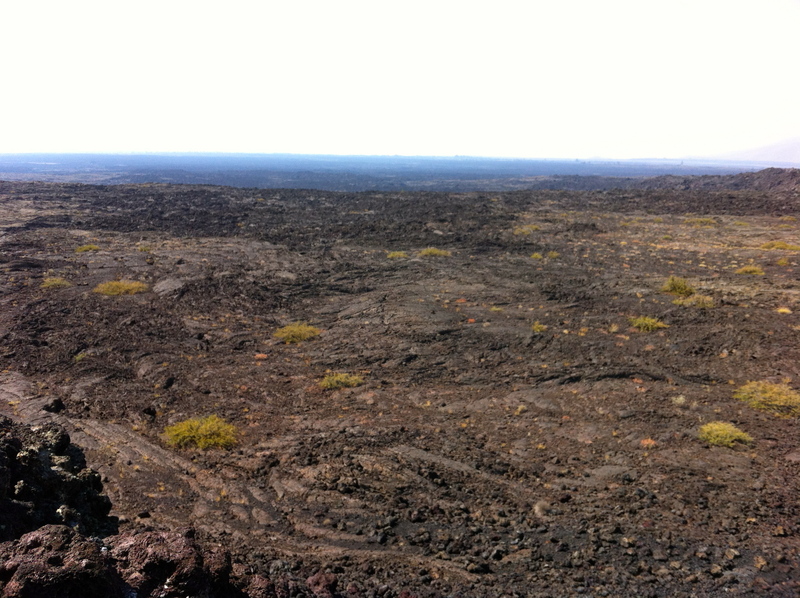 I completely agree, as it is certainly weird to see a lava field in the middle of Idaho flatlands, but that is what it is. The monument has about 7 stops on the auto tour, but the highlight was the lava tubes- walk-able tunnels through the hardened lava. One tube called Indian tunnel was over 800 feet long! 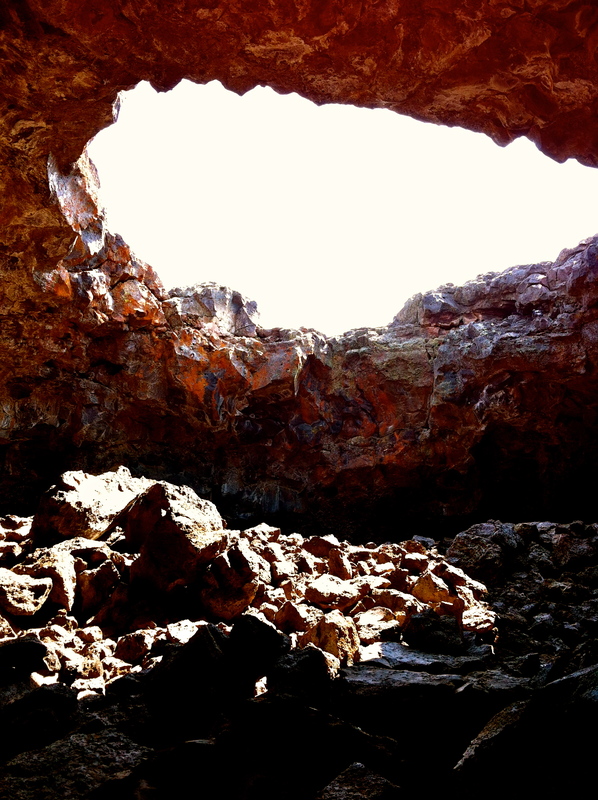 Another cave, called Boy Scout Cave, required a flashlight and actually had ice forming on the rocks in the cave, making it an ice cave in the middle of a lava field. The caves provided a much needed respite from the scorching Idaho summer heat of just under 100 degrees. After stopping for lunch in yet another brewpub in Idaho Falls (our 4th brewpub on the trip), we made it to Jackson, Wyoming. While the town has beautiful wooden buildings and a cowboy feel, it was overrun by baby-boomer tourists. I would say that 4/5 of the males in Jackson during this time of year are silver foxes or have a receding hairline. 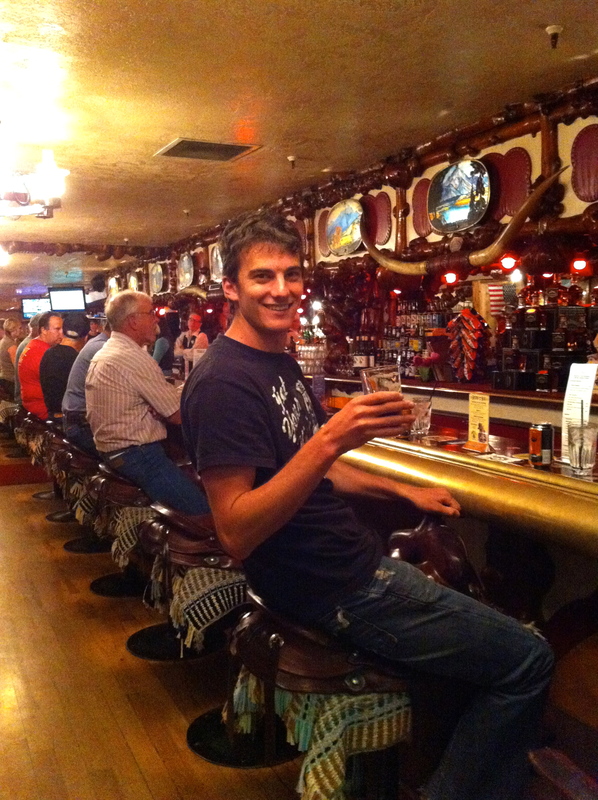 We had drinks at the world-famous Million Dollar Cowboy Bar where they have saddles instead of bar-stools before heading to dinner at the reasonably priced and delicious Genevieve Café. The Million Dollar Cowboy Bar features saddle barstools and line dancing. From Jackson, we were pressed for daylight. 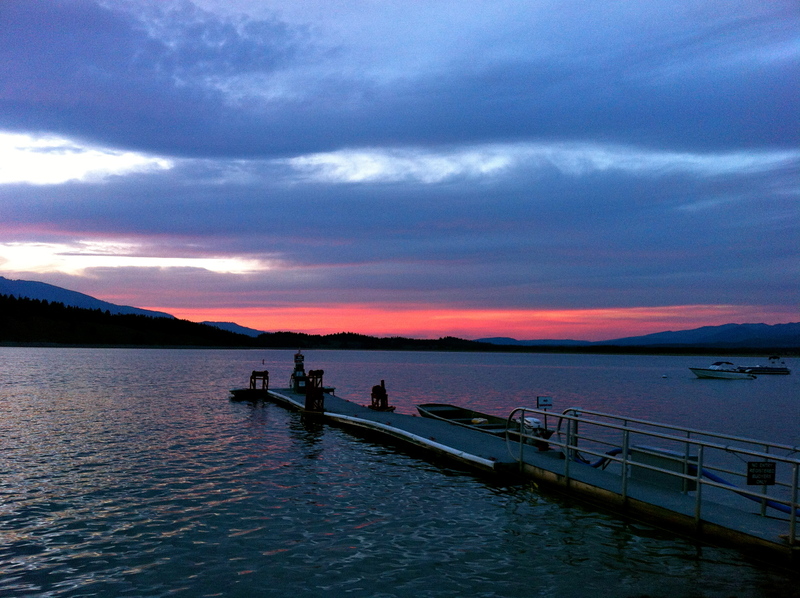 After a couple tries, found a campsite at the Coulter Bay campground on the shores of Jackson Lake. We got in right at sunset and instead of setting up camp in the light, I snapped some photos, so we had to pitch the tent using the headlights of the car.